How Much Compensation Should I Get for My Car Accident in Iowa? How Much Compensation Should I Get for My Iowa Car Accident? Each week we have people from throughout Iowa call and ask us how much their car accident case is worth? Despite popular myths, there is no formula to determine the value of a car accident case. As you can see, there is no cookie cutter approach to determining how much your Iowa car accident case is worth. However, a qualified Iowa car accident attorney can give you a rough idea of what a case is worth, if they have all the facts which usually includes reviewing your medical records, looking at the accident report, etc. While we cannot give you an estimate of what your case is worth without knowing the facts, for more information about Iowa car accidents we do offer a book that explains your rights, damages available to you and your responsibilities that we offer at no cost or risk. 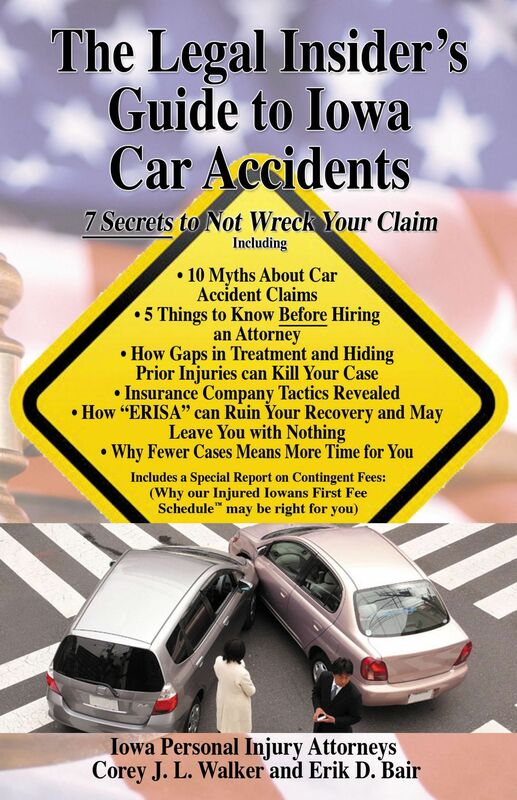 Request your copy now of “The Legal Insider’s Guide to Iowa Car Accidents- 7 Secrets to Not Wreck Your Case." We offer the book at no cost because we have seen far too many Iowans involved in car accidents make costly mistakes. If you have questions or would like assistance now then call our office 641-792-3595 and ask to speak with one of our car accident lawyers. If our car accident attorneys are not immediately available then ask to schedule a car accident evaluation that we offer at no cost to you.